The biggest advantage of vertical overlays is versatility. In addition to their ability to be stamped or carved to look like real stone, brick or slate, companies who supply vertical mixes have developed special stamping and carving tools that allow installers to mimic many other materials such as weathered wood, fossilized rock, botanical imprints, cut coral, lava rock and even bamboo. These overlays also can be pigmented, stained or faux finished in just about any color imaginable, whether you want to match the surrounding décor or replicate the natural colors of the materials they simulate. The overlay depth can be varied, too, depending on the pattern or look desired. Vertical overlays also permit total flexibility in the size of individual units in the pattern, which can easily be customized to suit the dimensions of the wall. 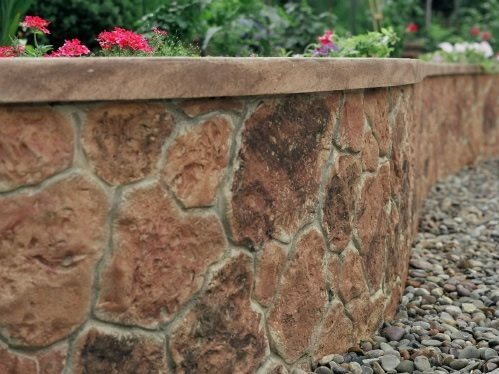 "You can do more with vertical overlays than manufactured stone because you can make the stone patterns any size and shape you want," says Andy Yoder of Flex-C-Ment. "The material takes the impression of stamps well and is easy to sculpt or carve. You can also work it around corners and fit it into narrow areas." Click here to view Design Ideas for Vertical Work from Around the World.